Product prices and availability are accurate as of 2019-04-19 01:22:33 UTC and are subject to change. Any price and availability information displayed on http://www.amazon.com/ at the time of purchase will apply to the purchase of this product. This eye-pleasing arrangement will be sure to impress even the most discriminating consumer. This gift includes mounds of yogurt pretzels, chocolate covered pretzel balls alongside a luscious dried fruit assortment and a butter toffee mixed nuts. Great gift for birthday, thinking of you, or any occasion Perfect gift basket for family and friends, or as a corporate office gift. 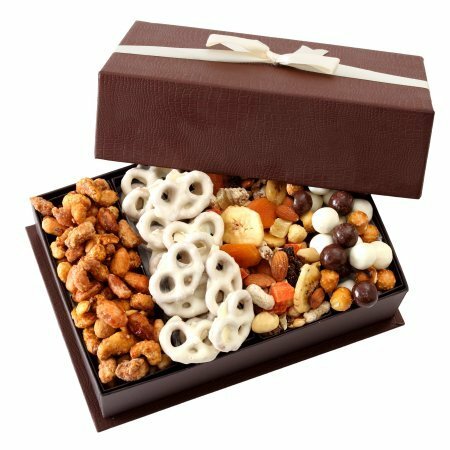 Gift Box Includes: Yogurt Pretzels (7oz), Fruit & Nut Medley (5oz), Chocolate Covered Pretzel Balls (4oz), Mixed Toffee Nuts (7oz) GIFT DIMENSIONS: 9" x 6" x 3" high Kosher Certified OK D. Giving a kosher gift ensures that all recipients can enjoy and partake in your gift.